Tanzania benefits significantly from transit trade, serving as a potential driver of economic growth, welfare and local enterprise development. This highlights the indispensable role of the government in promoting transit trade in the country. One of the highlights of the Tanzanian 2017 budget speech was the abolishment of value added tax (VAT) on ancillary transit services. This move supports the belief among people of Tanzania and the business world, of the country’s untapped growth potential in transit operations. Transit trade is vital in facilitating economic transformation and regional trade, offering multiple benefits to the surrounding society by unlocking the economic potential of those areas. Whether current economic policy in Tanzania supports transit trade is an empirical question we cannot address here. Nonetheless, for the first time, a detailed study has been conducted to assess how and to what extent Tanzania benefits from facilitating transit trade for her landlocked neighbours (Zambia, Malawi, Eastern Democratic Republic of Congo, Burundi, Rwanda, and Uganda). What benefits does Tanzania gain from Transit Trade? How do we assess these benefits? How could Tanzania leverage these benefits to support economic transformation? It provides evidence that Tanzania benefits significantly from transit trade, and that it is a potential driver of growth and job creation. The study applied the Global Trade Analysis Project (GTAP) framework which has multi-country database for conducting Computable General Equilibrium (CGE) analysis of international trade policy issues. A structured survey was used to obtain data for analysing the spatial impacts of transit trade on communities around the selected transit and border townships. Industry insights were obtained through interviews with industry operators. Direct: transits charges, clearing and forwarding agents, or fuel levies etc. Indirect: accommodation, restaurants, repair services etc. Induced: benefits from urbanisation in a transit location. The volume of transit trade has grown enormously over time. 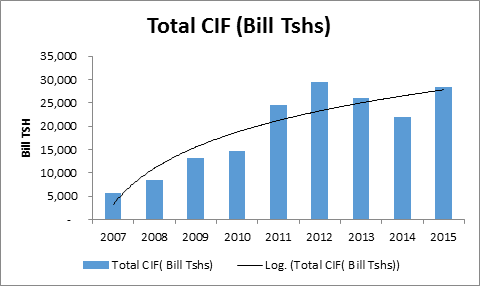 For instance, the cost, insurance and freight (CIF) value of transit trade increased five-fold in less than ten years; from under 6,000 billion Tshs (US$ 3 Billion) in 2007 to about 29,000 Billion Tshs (US$ 15 Billion) in 2015. Indeed, some analysts consider transit trade to be the third largest source of foreign exchange after gold and tourism receipts in Tanzania. Source: Author’s analysis using transit data (2016). There are large benefits to the economy (gross domestic product (GDP) growth, welfare etc.) when transit time/costs are reduced. As shown in Figure 2, the magnitude of impact to the economy increases with the magnitude of reduction in transit time. 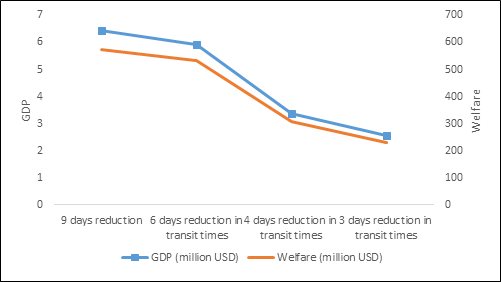 For example, by reducing transit time by three days, GDP increases by 2.5% compared with a GDP increase of 6.4% when transit time is reduced by nine days. The respective impact on welfare is 229.7 million compared with 572.3 million. Furthermore, the findings show that, reducing transit time has much bigger impacts on the economy compared to improving transport infrastructure. This is because the costs associated with transit delays (referred to as iceberg costs since they are vulnerable to time), have much larger effects on the transit operation. The findings imply that, the potential benefit of road infrastructure improvement cannot be realised if inefficiencies in customs and border management practices are not addressed. Source: Based on GTAP Model. The introduction of VAT on ancillary transit services has negative impact on transit trade. Estimates from industry operators show that introduction of VAT resulted in a 30% fall in cargo volume. In recognition of its potential negative impact, the Tanzanian Government abolished VAT. In the locations through which transit trade stops (either for customs procedure or park and rest), transit operations generate considerable spatial development opportunities that contribute to local economic development. 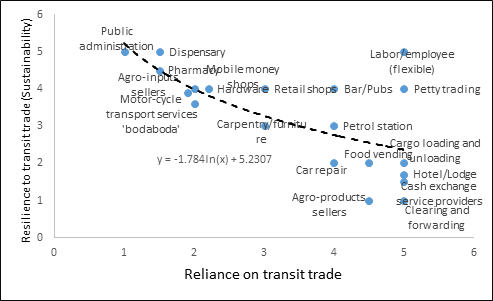 Although direct attribution cannot be established, interviews with households and enterprises show that transit trade was the main factor explaining establishment and growth of businesses, hence urbanisation in those locations. 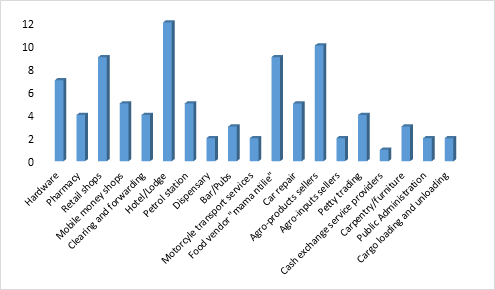 Figure 3 described the type of businesses – dominated by hotels/lodges, agro-product sellers, and retail shops, which have grown to be sources of income, jobs and livelihoods in these locations. For instance, a simple calculation shows that, on average, each enterprise in a transit location generates three jobs. Source: Survey of transit locations, 2017. It is important to note that some of the businesses rely directly on the existence of transit operations more than others (in terms of number of trucks or/and time trucks spends on the location). Such business (e.g. restaurant or guest houses serving truck/transit drivers) are directly affected when the number of trucks declines or when trucks take shorter times on the location. Figure 4 maps businesses on the extent to which they are vulnerable (hence resilient) to changes in volume or time delays in transit cargo. Such businesses, such as social services, hardware stores, or furniture making, do not rely as much on the transit of cargo. These spatial developments have led to a growth in welfare as households have wider choices of goods and services. This is due to increased competition, and farmers and land owners receiving higher value for their crops and properties respectively. Also, over time, there has been improved availability of social services (education, health, water and housing) among other (financial, business or transport) services over time. Growth of transit trade has been associated with negative outcomes, including increased incidences of promiscuity among truck/transit drivers (leading to increased prostitution, HIV Aids, and unwanted pregnancies), illegal immigrants, rising crime rates, theft and smuggling. Clearly, public policy has an important role to play (e.g. urban planning) in amplifying the spatial benefits of transit trade, and in addressing the associated challenges of population growth (congestion, environmental impact, and road accidents) and social ills. This research begins to explore the importance of transit trade in Tanzania, and will be extended in a follow-up study. It is expected though that the findings are generally applicable to similar (coastal) transit countries. The study provides a compelling case for the indispensable role of the government (both local and central) in promoting transit trade as a potential growth driver. iii) promote policy research and data for informing dialogue, and monitoring performance.